Minerva judges, Human Resources finalists and ICBC organizers at a recent ICBC competition. Minerva Canada was again proud to be the platinum sponsor of a health and safety competition during the 2014/2015 Intercollegiate Business School Competitions (ICBC) held at Queens University. In January 2015, members of the Minerva Canada Board of Directors judged the six finalists in the Human Resources Venue that involved the analysis of a case study focused on sustainability and a company’s social licence when introducing new products and technologies. Minerva Canada wishes to congratulate the student teams from Simon Fraser, Dalhousie and Concordia universities for placing in the top three positions respectively within the Human Resources Venue. The ICBC case studies sponsored by Minerva Canada are on this website. Minerva Canada plans to continue its sponsorship of ICBC in 2016. 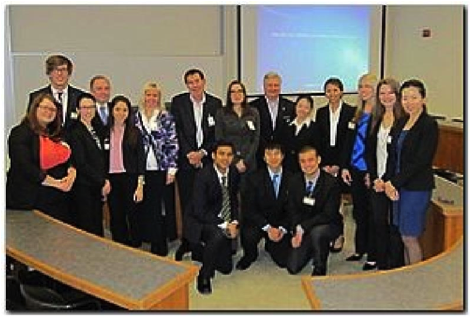 Hosted annually by the Queen’s School of Business, the Queen’s University Inter-Collegiate Business Competition (ICBC) is the pinnacle of undergraduate business case competitions in Canada that has garnered entries from top business schools across North America and Asia. Beginning in 1978 with only three events, Minerva Canada has provided case studies for the competition since 2007. In 2010, Minerva introduced, and continues to sponsor, a new competition – a Human Resources (HR) event. Today’s ICBC has eight distinct competitive events which include: Accounting, Business Policy, Debate, Ethics, Finance, Marketing, Management of Information Systems, and HR. 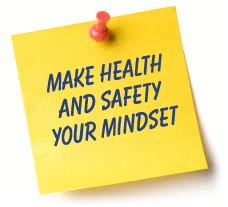 Minerva Canada’s addition links business ethics with occupational health and safety and raises awareness for managing H&S within business schools in Canada and abroad. ICBC is made up of two basic rounds: the Inter-University Round (IU Round) and the Final Round. Schools select a competitive team to enter each event in the IU Round, where students enter a written submission in response to a business case. Queen’s School of Business faculty evaluate these written submissions and choose six teams to then qualify for the Final Round. At the Final Round, competitors are given five and a half hours to develop a solution to a written case and develop a 15-minute presentation outlining their business solution to a health and safety issue. The competitors then present their solution to a panel of judges, some of whom are Minerva Board and Committee members. For more information, visit http://icbcqueens.com/.